Search Results for "Cinque Terre"
Manarola Village, Cinque Terre Coast of Italy. Manarola is a small town in the province of La Spezia, Liguria, northern Italy and one of the five Cinque terre attractions to tourist visiting Italy. Riomaggiore, Cinque Terre, Italy beach and dock. Riomaggiore is a traditional fishing village in La Spezia, situate in coastline of Liguria of Italy. 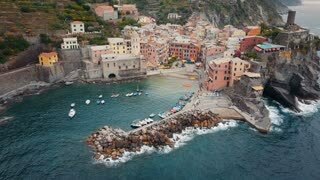 Riomaggiore is one of Cinque Terre travel village. Wide shot from handrail of a small road on the coast of Cinque Terre, Italy. Shot with GoPro in 1080p HD. CINQUE TERRE, ITALY - OCTOBER 9, 2014. Focus shifted view of Manarola Village, Cinque Terre, Italy. Manarola is a small town in the province of La Spezia, Liguria, Italy and one of five Cinque terre attractions to tourist visiting Italy. Cinque Terre, Italy. Sunset view of tourist destination village Manarola, Cinque Terre, Liguria, Italy, Europe. POV shot of a man picking up fruit at a local fruit stand in Cinque Terre, Italy. Shot with GoPro in 1080p HD. CINQUE TERRE, ITALY - OCTOBER 9, 2014. Iconic View to Manarola (Cinque Terre), Italy. Breathtaking view of the Italian coast at Cinque Terre National Park. Panning shot. Incredible view of a small Italian town in Cinque Terre. Aerial establishing shot, pull back tilt up. Birds eye view of the terrace vineyards of Cinque Terre in Italy. Slow tilt up reveal. Sunset along the coast of Italy at Cinque Terre. High altitude aerial shot. 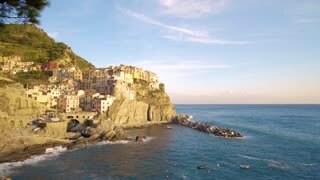 4K aerial shot: panorama of the Riomaggiore city in the Cinque Terre (five towns), Italy.